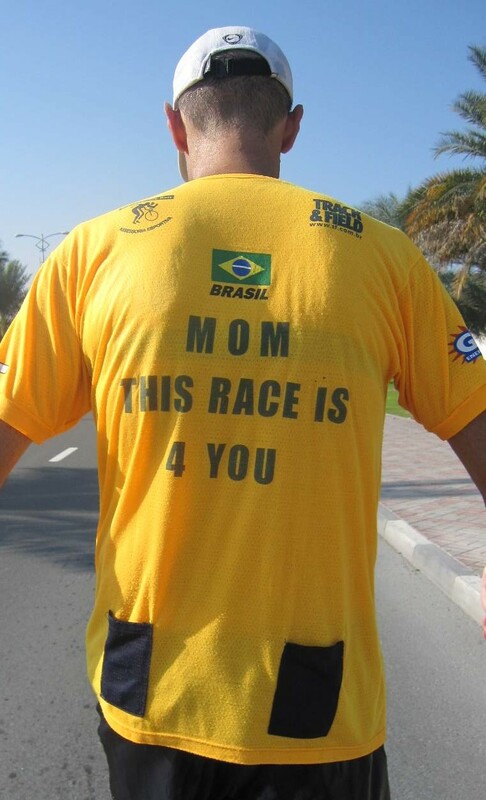 I knew I was going to have an interesting run in Dubai. I was pumped about it all week. Even a little too excited, because after I met Haile Gebrsellasie at the press conference on Wednesday, I went for a run in the evening and kinda overdid it. 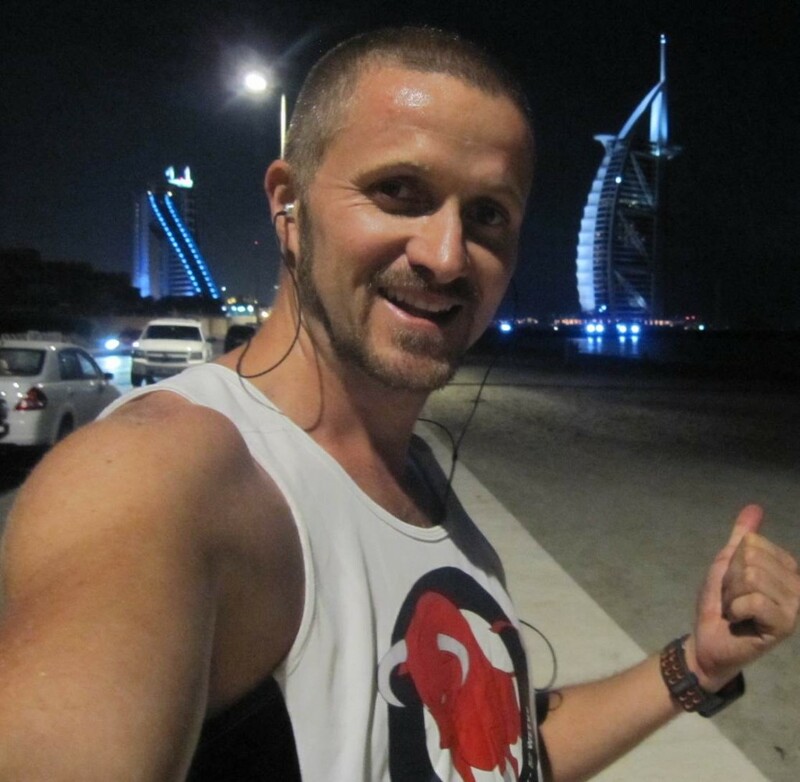 I ran from the Jumeirah Beach Residences, where we’d been staying with local hero and old school buddy Adam Peake, right up past Burj Al Arab, the cool sail looking building from the postcards. I was actually looking for a piece of road that ran along the beach, as recommended by a local Austrian runner, Marek and his wife Deborah. I found it, ran along it and after 16km, decided I’d done enough and hopped in a cab home. It wasn’t a bad run at all and for a good chunk of it I was running along the marathon track, so I got to see what I was up against… Long and flat was the most notable insight, which was cool with me, because I was already tired from Sunday’s Mumbai Marathon. In fact, the biggest hills were the speed humps at pedestrian crossings. But, as I was eager to feel good and run like a champion after seeing Haile, I ran an average 4:45 per km and started to feel my calves tighten in the final few kilometres. Of course, that made me stress a little, but tight calves is nothing new and I did a little self massage when I got back to Adam’s. Daz offered to help and I keep meaning to get him to work on me, but it’s rarely a convenient situation to lie down and let Daz do his magic. I’m still not really that comfortable with it, though I’m just as bad when it comes to seeing any kind of therapist. The times Daz has had a go, he’s done a very good job. By Thursday arvo, I felt ok again. Daz and I went shopping at the Mall of the Emirates, the massive joint with the ski slope in it…. What a ridiculously awesome excess to stick this thing in the desert!? I mean, it’s a very good setup and plenty of kids were frolicking about in the snow, sliding down on toboggans and inflatables. The mall itself is enormous and has every type of fashion and accessory shop you can imagine. Daz bought me a pair of Quicksilver boardies as a belated birthday present and I bought him a new Canon Ixus, because the 2 Sanyo Xactis we’ve been using have been doing a less than impressive job. Now we’ve got two Canons on the go, so hopefully we’ll get better photos and more video. Then it was off for some real Dubai style site-seeing. 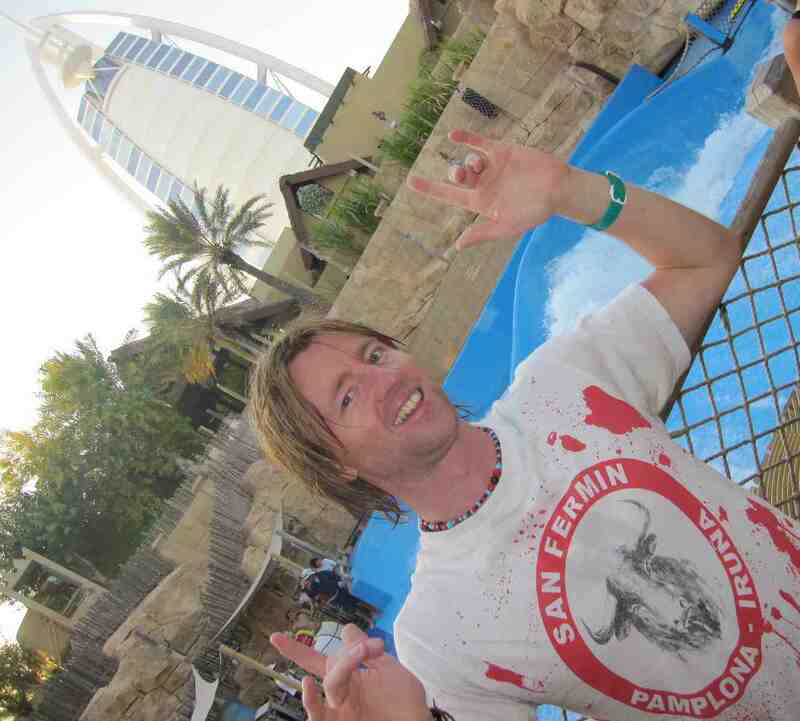 We went straight to the famous Wild Wadi Waterpark and it was WWW.AWESOME.COM! I hadn’t been to a waterpark since I was about 15 and I had always enjoyed them, so this was a little gift to us to relax a bit. I got there a little stressed out though and was sceptical, after paying a somewhat exorbitant entry fee (about $120 between us), I really didn’t think it would be as great as it needed to be. But I was wrong… It was really great fun! We went on a few different slides and even tried body boarding in their wave pool. A few sections were shut, but the rides that were going were loads of fun and we went on each one a few times. Typically, the true excessive nature of the Arabs here came out, with most of the slides actually going up instead of down…. You’d get in an inflatable tube, get pushed onto a slide on a steep incline and the sheer pressure of the water jets at the start of each section would jettison you up the slides. Pretty quick too and by the end of the first section, I was laughing my head off. 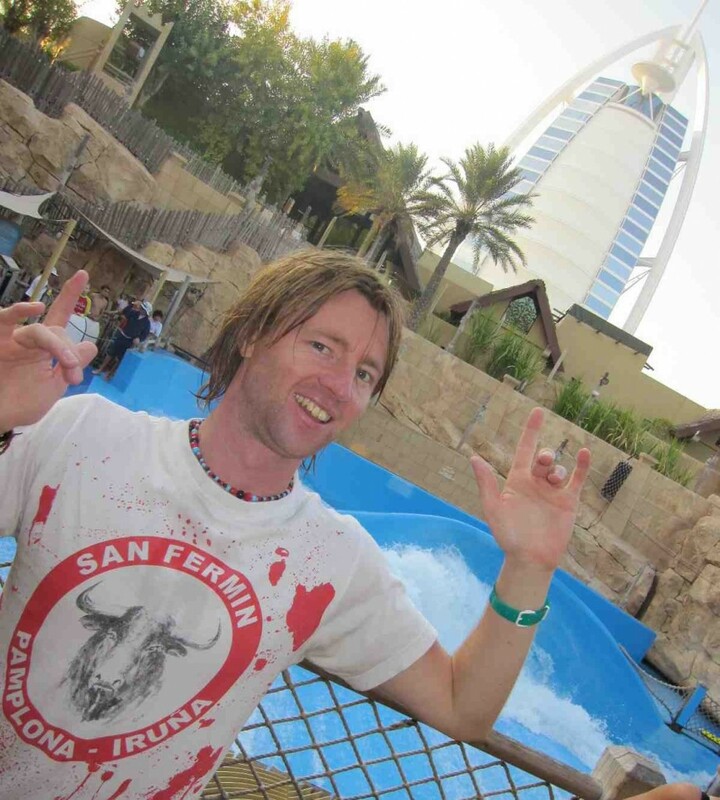 Daz and I went on another super steep slide, that ran from a tower with awesome views of the Burj Al Arab and punched you down to ground level in seconds flat. It scared the hell out of both of us and we screamed like terrified kids as we almost came off the slide in the last slope. I was pretty shaky and had a massive wedgie after the first time, but went back twice more to overcome my fear! Haha… It was good fun for a few hours and we both felt pretty tired, but relaxed, after. That night we went to a cool bar called Barasti, which sits on the beach next to Le Meridien hotel. It’s obviously super popular with the local expats, but you do get the feeling that it’s a slight meat market. Loads of expats live and work in Dubai, apparently over a million, so most people there seemed to be cashed up and ready to party. Plenty of tools though, which is to be expected in these places, but we were there with the lovely Hannah and Leanne, Adam’s fantastic housemates, a cool couple from Perth, Jarrad and Laura, plus another top bloke and old school mate, Nick Van Santen, with his beautiful partner Renata. We’d actually been at Nick and Renata’s a couple of nights before and had been fed the best meal I’ve had in a long, long time – thanks guys! It was good to hang out and know some people, trying to relax a little before the run the following day. I left about 11pm, while Daz stayed with the others to party on what is essentially their Friday night (the weekend starts Thursday here too). I got a few hours sleep, but was more nervy than usual. I got up at 5am and woke Daz too. Poor trooper had only got to bed at half 3, so he wasn’t switched on straight away, but he still got up to come help me. We wandered down to the start line, with what I thought would be plenty of time for another quick toilet break… Boy, was I wrong. There were LOADS of people down there for the 10km and marathon. I was to find out later that there was no half – I’ve gotta read more of the race info.. With so many there and the 10km starting at 6:45am, only 15 mins after the marathon start, the queues to the toilets were enormous and I was no chance of going before we started. So I moved toward the start instead, waited for them to open the start chute, so we could go toward the line and said my goodbyes to the mighty Dazzler. He wished me luck and hugged me again, seeing I was a little flustered by not getting to the loo and worrying about how this run would turn out. “It’s alright mate, you’ll be fine!” he said, grabbing my shoulder. Sure sure, I know, I was thinking, but I was a little uneasy about this one. There wasn’t too much excitement as the siren went off to sound the beginning. A cheer did go up, but that was for one reason only – the greatest distance runner of all time, Haile Gebrsellasie, was taking off with the other elite competitors, looking to smash another world record in Dubai. Just meters ahead of me, the great man had begun his quest and moments later, I crossed the line and followed in his footsteps… Spine tingling stuff! Pretty much all the competitors around me were Anglo, which was a little bit of a surprise. Some Japanese and Filipino, some Indian, but the majority were from the banking and construction industries that had thrived here for the last couple of decades. I heard English voices, Swedish voices, Irish and Spanish. 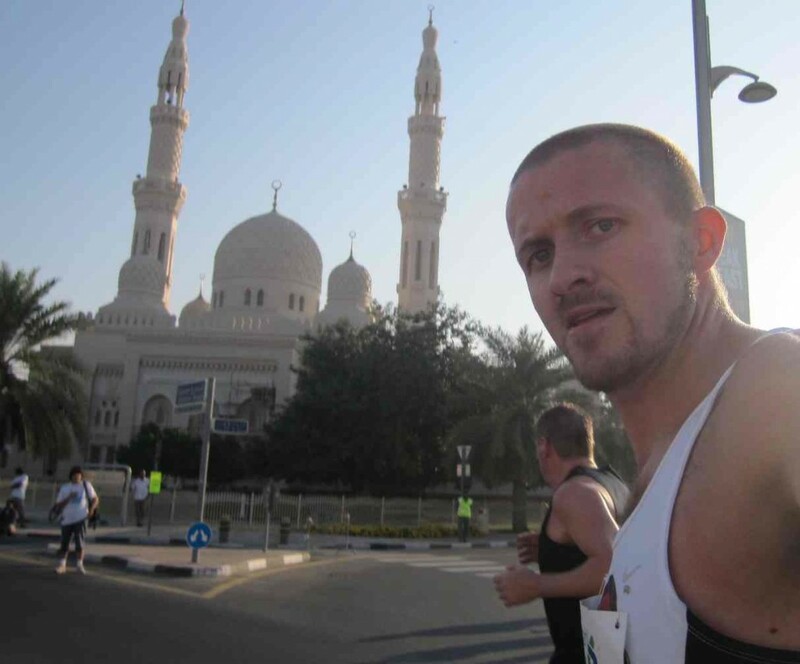 Americans and Aussies were prevalent too and you could tell that this was quite a representation on Dubai itself – a city built on the needs of an International community, with a run to show off how progressive this place is. 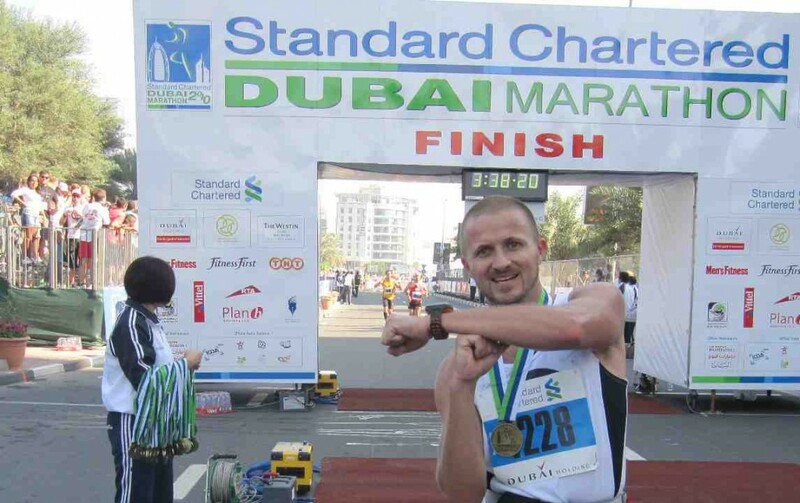 It’s the richest marathon in the world and it attracts the world’s best, but I imagine you could say that about the city too – rich beyond my comprehension, attracting smart operators and the best in their fields to work and aid the progression of Dubai. I trotted along and got some photos of the very diverse field. When I say diverse, I mean the body shapes of those trudging along in the warm up stages were of all descriptions, though a huge number seemed to be wearing the top of their local running squad. Must be some big running clubs here. They all looked pretty fit though and I had no doubt most would complete the mission. It did have me wondering if their were a lot of half marathoners here, so I sidled up to what sounded like a couple of Aussies (the Aussie flag cap kinda gave it away) and asked them if the half started at the same time. They laughed and said there was no half, but if I didn’t think I had it in me, I could get a cab back to the start at halfway…. I laughed along and thanked them, but didn’t try to convince them I was having a crack at number 4 in 3 weeks, because maybe today I didn’t have it in me – who knew?? Instead I trucked along with the realisation that this was yet another example of things not being done in half measures in Dubai. You’re either doin it large, or not doin it properly! I have actually registered the URL, MassiveTown.com, for future use, mostly coz I think it’s cool, but I’ve never seen anywhere that it applies better than here in Dubai. Everything is big and excessive, even a little overkill. I do have a little blokey piece of me that absolutely loves all that stuff. I mean, we talk about living life to the full, living to the extreme, so in many ways that’s what is happening here… I may not approve of all of it, but the enormity of it still impresses me no end. I kept an eye out for a toilet and finally came up on a couple after 4kms. I waited for about a minute for the cubicle to become vacant, only to find that their was no toilet paper! Booooooo.. I kept on running instead and found the same problem with the next set, some 4 kms later. 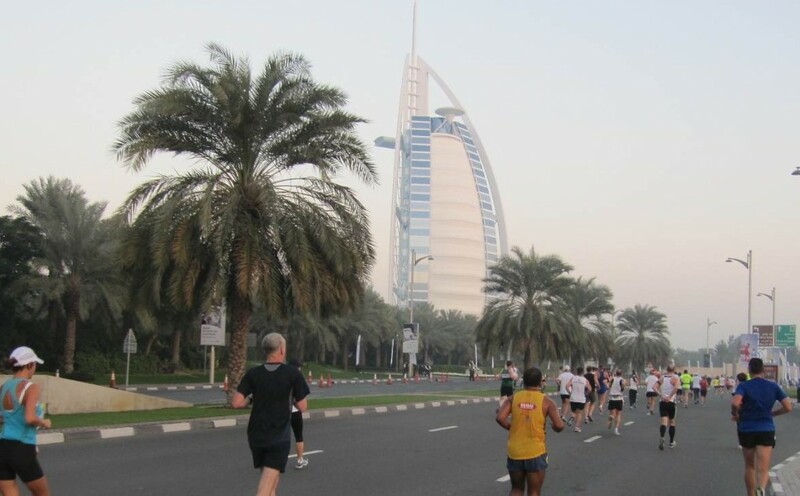 I tried to put it out of my mind, so I focused on the fact that I was running in a brand new place, down what is normally a busy Dubai arterial. They’d done a great job to shut it all down and their were plenty of spectators on the side of the road, mostly the families of middle aged white collar workers supporting their wives, husbands or friends. In stark contrast to this was the large groups of uniformed Indian or Asian workers, on their way to the hotels and entertainment venues that lined the beach we were running near. They stopped and waved, waiting to cross the road, but while so many runners spent their morning punching out the kilometres and achieving their personal goals, these people were getting to their 6th or 7th day of work, so they could keep the flow of cash going back to their families in far off countries. I’m not going to pretend to understand the dynamics of Dubai’s community, but I’ve rarely seen a more obvious socio-economic division (I’ve avoided using the word “class” because it’s not fair). It all works fine, but it’s clear who runs the show, who works here to advance their careers and who does all the grunt work to keep the wheels turning. I was told that some of the workers there only earn $75 AUD per week…. They work really long hours in an expensive city, so for $75… well, I just can’t figure that out. Cruising along, I came up on 11.5km after an hour of running. The one hour mark meant that Haile should be rounding the turn to head back. If he’s on track he’d be passing me within about 4 or 5 kms, aiming to make it to the 30km marker – which I could see on the other side of the road – by 1:30 or faster. What a machine! A little bit later I finally came up on a service station, raced around the back to find a male and female toilet. The male was occupied, so I just went for the ladies. Problem was, no toilet paper! But, they did have a bidet hose, so I gave in and got it over with. No sense letting this ruin my run! I’d lost so much time with toilet searching that I was beginning to get stressed about my self imposed 4 hour time limit. In fact, as I looked at my Garmin (a 310XT) I noticed that the bloody distance meter was still ticking over, even though I was dead still! Up to then the track markers on this run had been the most accurate I’d come across, synchronising with my watch easily, now my watch was ahead by 800m… I find this sort of thing super frustrating and cursed the watch for the recent annoying behaviour it had exhibited… More on that some other time. I got back on the road feeling a little more relaxed. I grabbed another bottle of water from the next stop and drained half of it. The water stops were plentiful and well manned. You could get electrolyte drinks from most as well, so there was no problem staying hydrated. The race really is well organised and I found that I could time most drink stops easily. The sun had risen by my 15km mark and but there was still a cool breeze coming from the nearby sea and I felt pretty fresh. Great running conditions really. Then I noticed up ahead that runners were veering to the side of the track, peering over the fence to the empty road on the other side.. He was coming! I pulled my camera out and ran to the left, just as a procession of police motorbikes and cars powered down the road in front of the race leaders. I flicked on the camera, pointed it in the general direction, but didn’t look to see what I was recording. I had to see this with my own eyes. Emerging through the array of vehicles were two majestic runners. They were both African, but I only zoned in on one.. “GO HAAAAAAAAAIIIIILEEEEEEEEE!!!!!! !” He was absolutely flying and I looked at my watch. 1:24, with a few kms to the 30km mark. Take into account that I started a few minutes later, so maybe he was on track… How awesome! I was running an international marathon and the world’s greatest distance champion was running just meters away from me, looking like he may smash a world record… Too cool, even if just for a moment.. I was pumped again and I jetted along for a while, wondering how I’d go after halfway. As I got closer, I realised that I was a long way off what i was hoping for. I aim to make the halfway at 1:50 or better, because that means I can cruise and look to lose a few minutes in the back half but still go under 3:45. I had also mentioned in the press conference and to a few others that I’d like to go under 3:40 for this one…. Being on a fast track and in the footsteps of greatness, I had somehow decided this was the time to aim for. So when I passed the 21km at 1:56, looking down the barrel of a 4 hour marathon, I was annoyed at myself for letting the time get away. The toilet fiasco didn’t help, but I really hadn’t been running quick enough either. I made the turn to head home moments later and as I looked at the long stretch of road ahead of me, something snapped.. Bugger this, I thought. I’ve been sitting on 5min kms and even up to 5:30s for too much of the last few races. Some quick calcs said that I’d need 4:45s to drag the time back toward a 3:45 finish. Plenty of people were at the turnaround and I’m sure someone yelled out my name. It’s a little thing, but I felt it urge me on. I stepped it up and questioned my body. Everything was in its right place and my calf wasn’t hurting. I wasn’t feeling lethargic and I’d consistently had my own strong mix of Gatorade. I downed a GU and hoped that the 2 I had left would be enough. As soon as the new pace was set, I was passing people. I’ve said before that this is a big motivator and today was no different. As I saw the pained faces I was passing, I judged that I was pretty good in comparison, pushing a little faster to see how I’d go. I felt great! I ran past a few spectators and they cheered me heartily. As I passed one group a guy yelled out “52 marathons in 52 weeks!”. Haha, I had some support out here after all! I banged out a couple more kms and passed what seemed like a big group of Uni students. They clapped and hooted as I got my camera on them and I loved it. I powered past runner after runner and didn’t feel tired at all. I thought about how much harder Haile worked on this very track just an hour and a half earlier. He’d be done by now, but that didn’t mean that I couldn’t run proudly in his wake. Maybe he’d broken the world record, maybe he’d won at least, but either way I was running on the path of a supreme running machine. As I headed toward the 30km mark, I found that I’d picked up loads of time and was close to a 3:45 finish, possibly under. I thought, if I can get to the 32 marker at 2:50, then I only had to hold 4:30s to go close to 3:35…. “Hang on”, I said to myself, “what’s important here? Getting a comfortable 3:45 and being able to back up on Sunday, or pushing too hard for your own personal glory and risking your body?” I thought about my sister Rebecca, the eldest of my 3 siblings, who’s birthday it was that day. I’m the youngest, but the tallest of our brood, so I kid around by calling the girls my “little” sisters. Rebecca is anything but little though and I don’t mean bodywise. She’s fit, healthy and has one of the most dominant and powerful characters I know. She’s so determined to get things done, that she only sleeps 4 hours a night, power walking in the morning, hitting the gym, plowing through a long work day and seeing her friends in the evening. She does it all, doesn’t complain and I swear, her appetite for life just keeps on growing. So, I thought, what would Bekko tell me to do at a time like this…. “You feel good?” she’d ask… Yeah, I feel pretty good. “Does the risk outweigh the return?”… Ahh, well, maybe… “If you feel good and the risk is worth it, then you know what I’d do”, she’d announce quite frankly.. The plan was to stick to 4:30 and try to speed up if I had drinks breaks. I was passing a lot of people now and bystanders were looking at me funny, as if to say – “How does he have so much energy left and why didn’t he use it earlier? !” One guy even said, “This dude is flying, he’s going to sprint home!” And I was really pumping. It felt great to be in control and make that demand of my body, having it respond without question. It’s rare that you get to feel that type of control so late in a race. I hadn’t really had to hurdle the wall this time, I just powered up so much that I punched right through it. My brain was in complete control and the only thing that began to worry me was my old adductor strain. I could feel it tighten, but it didn’t feel as bad as it had in the past. I thought about what good old Pat Allen had done when he tried to help me. He’s a manipulator who moves the tendons around bones, looking for a point of release. He’d told me I had mild Osteo Pubis, which triggered a variety of problems. To help fix it, he’d stuck his fingers right into my groin and grabbed the tendons around my pubic bone, flicking them about… It hurt like hell! But, I figured, why not try to release this a little now and fix it later? So instead of slowing down, I jammed my fingers into the right side of my groin and found my pubic bone. I held the fingers there while I ran and let the movement of my stride slowly work the area free. It was probably not what any therapist would recommend and, to be fair, it’s possibly pretty stupid and not something I’d do regularly… but it sorta worked! It still hurt like I was stabbing myself, but the muscles began to loosen. I kept my pace and plowed along the road. I felt that rush of power that allows you to separate your brain from the pain in your body. It spurred me on and I pushed harder. I looked at my watch and saw that I was looking like a 3:37. I felt awesome and figured I may even have a little more to go. I downed a GU and kept punching down the road thinking of all those times my buddies from Tribal and I had run out slowly and then flew back to the start point at blistering pace. I felt them on my back now and pushed along the road feeling unstoppable. As I passed the 38km mark, I knew on was going to finish with a good time. I didn’t want to slow down for anything. I downed some more Gatorade and lengthened my stride a little. 40km came up pretty quick as I got closer to the area, Media City, where the finish line waited for me. I patted guys on the back on the way past and cheered them along. They knew it was time to get going, so they began to lope again. 41km came past and the crowd had thickened. I pumped up, know it was just another 5 minutes of running. I looked at my watch and knew it would be close to 3:35, so I dropped one last gear and started to sprint. 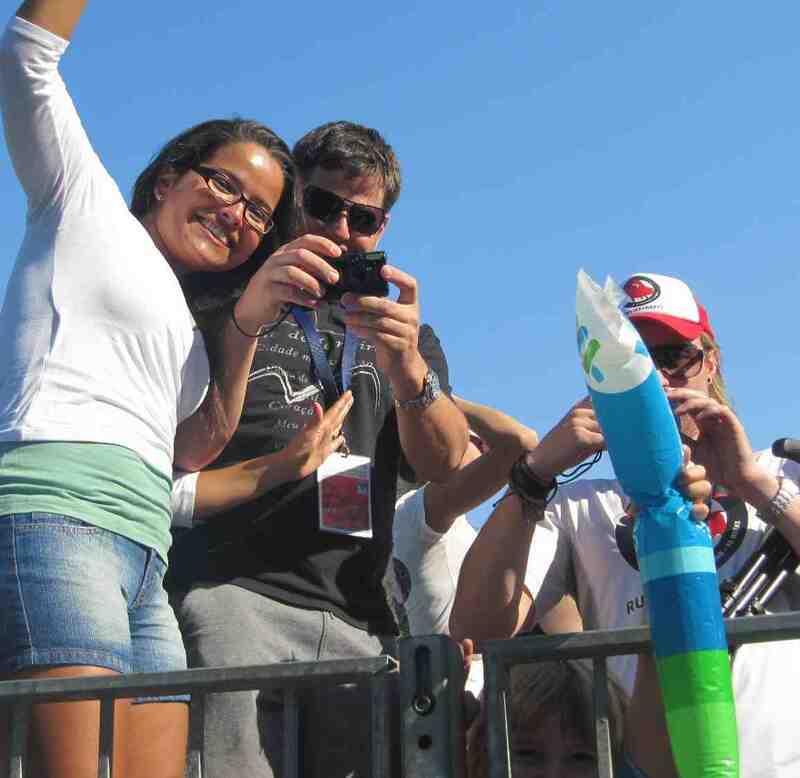 As I came around the final bend, the people on the side of the track were going crazy! I looked at the line and gave it everything I had, thinking I may be able to cross under 3:35. I was all about that line and found something deep in me that let me sprint when all I should be able to do was fall down, crossing in 3:35.15. I was pumped! I’d run a 17 minute negative split, finishing the second half in 99 minutes. Daz didn’t even expect me, so hadn’t even got his camera out. He was in the stands with Nick, Renata and Adam. I loved that they were all there to cheer me on. I felt so excited about running fast and I wanted to share my story straight away. I came up into the stands for hi fives all round. We went and grabbed a coffee, then headed back to Adam’s palace to have a feed. Leanne and Hannah cooked up an absolutely stunning breakfast, better than anything I’ve had in a Melbourne cafe. I scoffed it, got seconds and scoffed it too. Thanks so much girls. Later, after a snooze, we went for a beer down at Barasti and met some other runners, including Marek and Deborah again. I even met a fella named Chris Murray that was moving to New York and told me to hook up with him, as he knew another mate from home that was moving there, the mighty Stickers. Small world. Adam then took us to the airport. We had a flight at 1am, which would take us to London via Qatar. We would have a few hours to see my beautiful sister Alexis, then off to Gran Canaria, for round 5 on Sunday… This flight and that run had me nervous, but it was time to leave the comforts of Dubai and get going. We said goodbye to Adam, but I thanking him was never going to be enough. He’d picked us up and dropped us at the airport a number of times. He’d had us in his home and given us anything we needed. 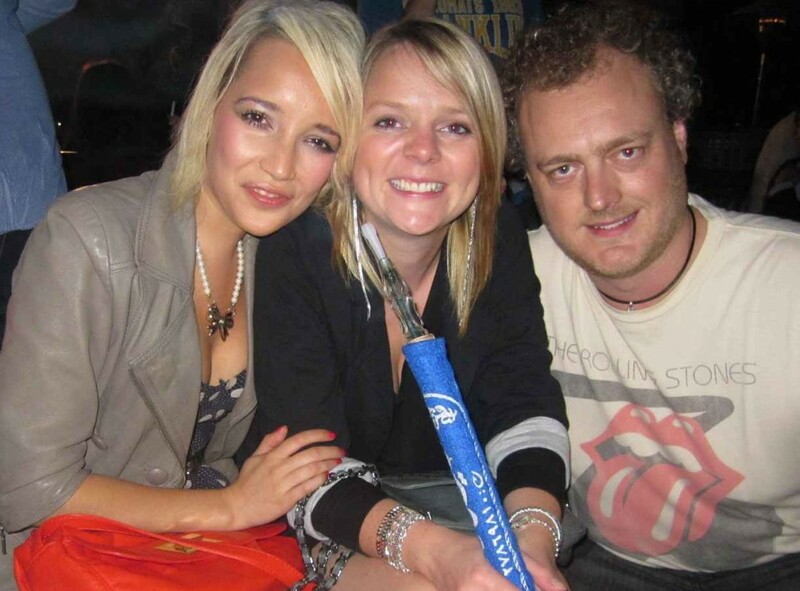 He introduced us to his insanely fun flat mates and supported me through my race. He even ordered our t-shirts and a cap off the internet and made a $360 personal donation! He’d gone above and beyond, to a ridiculous extent. So right here, I just want to let you know Adam – YOU ROCK THE CASBAH! 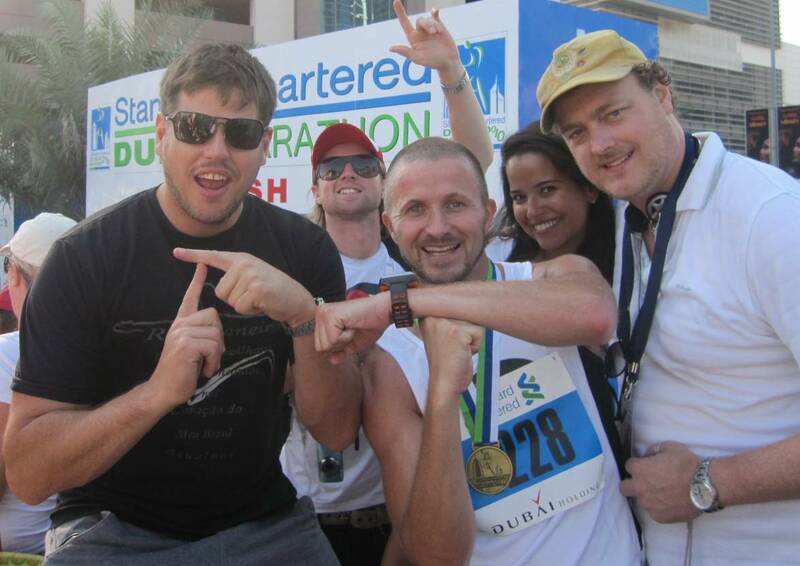 Thanks for having us Dubai, we had a blast! Keep an eye out for Gran Canaria report, coming real soon. The reason all health care be it private or medicare are so expensive is because $700 billion currently goes to health insurance overhead and administration and this does not include stock dividends. Fraud is not a viable justification for denying health care. The costs and fraud are in fact screaming for reform. By January 28, 2013 – 6:28 pmIm rebuff practiced, excluding I touch you merely completed the greatest position. You undoubtedly make out what youre speaking about, and I can really get at the back of that. Merit for staying hence frank and hence straightforward. Excellent interpret, I merely approved this on a isolated who was doing some examine on that. In addition to he actually bought me lunch ever since I found it for him smile Thus assent to me rephrase that: Thanks for lunch! “Bill Dickey is learning me his experience.” by Lawrence Peter Berra.